Two opposing trade winds generally govern the weather pattern: the north-westerly trades blow from October to March when wind speeds average from 8 to 12 knots; and the brisker south-easterly trades blow from May to September with winds of between 10 to 20 knots, bringing the cooler and windier conditions ideal for sailing. The periods of calm between the trades produce fairly warm and wind-free conditions throughout April and also in October. Conditions for swimming, snorkelling and especially diving are superb during April/May and October/November when the water temperature sometimes reaches 84°F / 29°C and visibility is often 30 metres plus. 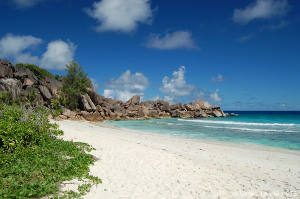 The Seychelles’ climate is one, which is always warm and does not reach extremes of heat or cold. The temperature rarely drops below 75°F / 24°C or rises above 90°F / 32°C. 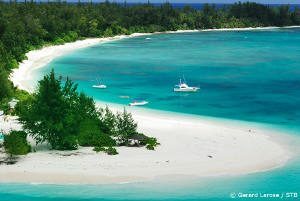 All but the remotest southern islands lie outside the cyclone belt making Seychelles’ a year round destination for sun worshippers and beach lovers. It is generally cooler when the north-west trade winds blow during the months of November to March. The sea is generally calm and the weather warm and humid, with average winds of 9 – 14 mph / 15 – 22 kph. On average the number of rainy days during this period is 11 with long periods of sunshine. Dry spells of two weeks or more are fairly common. A larger amount of the annual rainfall falls during the months of December to February compared to other months. The average number of rainy (days with 1 millimeter or more rainfall ) in December, January and February are 18, 17 and 11 days respectively. It is also fairly cloudy at times during those months and therefore less sunshine. The weather is hottest from December to April, and the humidity is high – often 80% or higher. The months of May to October bring drier, cooler weather, and livelier seas – particularly on south-eastern coasts – and winds of 12 – 23 mph / 19 -37 kph are common. This section aims to provide you with instant knowledge of the destination, orientating you in such a way as to allow you to make the most of your vacation. Everything you need to know is here, from immigration and health requirements to banking regulations and credit cards, medical services and information about electricity, communications and drinking water. Of particular note is the ENTRY FORMALITIES section that lists all the requirements for entering Seychelles. Among other things, it advises that, whatever the nationality of the visitor and his or her family members, NO VISAS are required for entry. Light clothing suitable for Seychelles’ warm tropical climate is recommended and visitors should prepare themselves for the relatively hot, humid atmosphere and for plenty of sun. Bring hats, sunglasses and adequate UV protection – SPF30+ is advisable. It is important to remember that even on an overcast day the tropical sun is still strong and able to cause unpleasant sunburn. Wearing a t-shirt for the first swim or snorkel is a good idea. A camera is an absolute must! Please bring a stock of film (particularly for non-standard cameras and video cameras) together with a supply of batteries. Casual evening wear (long trousers for men), together with appropriate footwear, is necessary for dining out and for gaining entrance to casinos and most hotels. Sturdy walking shoes are recommended if you intend to take guided walk and trail excursions. Visitors suffering from a specific medical condition should be sure to bring an adequate stock of the appropriate medication along as well as their preferred brand of sun cream, mosquito repellent etc. Presentation of all of the above documents will grant you a Visitor’s Permit that will be issued upon arrival by the Seychelles Department of Immigration. The Visitor’s Permit is initially valid for the period of visit of up to one month. It can be extended for a period of up to three months from the date of issue and capable of further extensions for successive periods not exceeding three months at a time to a maximum period of twelve months, provided that the person still meets the criteria of a bona fide visitor. The Visitor’s Permit is issued free of charge for the first three months, after which there is a fee of SCR5,000 for extension covering each period of three months or any part thereof. Health requirements for visiting in Seychelles are minimal. You will be asked to fill a small section on the arrival form that will be handed over at the airport immigration desk. There is no yellow fever in Seychelles and as a precaution, a valid yellow fever vaccination certificate is required from travellers over 1 year of age who come from or who have passed through a partly or wholly infected area within the preceding 6 days. There is NO risk of contracting malaria in Seychelles given that the anopheles mosquito does not exist in Seychelles. Health clinics exist on the islands of Mahe, Praslin and La Digue and there are dispensaries on each of the islands offering accommodation. 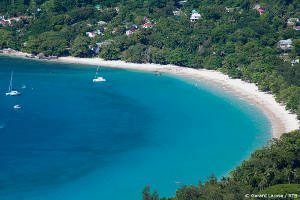 There are also private health and dental clinics on Mahe, Praslin and only one private health clinic on La Digue. Hotels have the contact of these private practitioners should their in house resident guests need medical assistance. Following are the list of public holidays in Seychelles for 2017. Throughout Seychelles the voltage is 220-240 volts AC 50 Hz. Seychelles uses the British standard square three-pin, 13 amp sharp electric plug. Visitors from the USA & Canada and other countries other than the United Kingdom are advised to bring their own adaptors. Most charges (restaurant, hotel, taxis, porters, etc) already include a 5% to 10% service charge or “tip” and so tipping is not obligatory in Seychelles. However, as a reward for exceptional service, a nominal tip is sure to be warmly received. With 115 islands scattered across the Indian Ocean between 4° and 10° south of the Equator, Seychelles offers diverse and impressive diving opportunities. The Inner Islands, remains of a submerged mountain range, rest on a shallow plateau with prolific marine life and excellent PADI diving facilities available to access a multitude of dive sites. The Outer Islands to the south of the archipelago are all coralline or sand cays and mainly uninhabited, presenting the experienced diver with excellent opportunities to explore where few have gone before. Diving is possible all year round but is governed by an island’s position and the prevailing winds. Generally speaking, the best conditions for both the Inner and Outer Islands are in the calm periods, April-May and October-November, when the water temperature can rise to 84ºF / 29ºC and offers excellent (up to 33 yards / 30 metres) visibility. In December and January, the northwest winds blow but conditions remain much the same as in the calm periods, with the exception of greater surface movement and some localized turbidity. From May to September the winds are stronger and blow southeasterly. Visibility and temperature may thus drop during August with water temperatures of around 77°F / 25°C. A wet suit of at least 4mm is necessary. Unlike the Inner Islands, some of the more southerly Outer Islands are close to the cyclone belt, and during these months they can experience extremely rough conditions on occasion. A 4mm shorty wetsuit is the minimum protection recommended for the Outer Islands. Islands with big drop-offs and walls often have marked thermo-clines with temperatures ranging from 66 to 81ºF / 19 to 27ºC and a full suit is an advantage for most divers. With 43 Inner Islands to choose from, variety is the order of the day. All of these northerly islands offer impressive granite reef locations where the sculptured rocks can be covered with soft corals and sponges, and fish life is prolific, due to the archipelago’s isolation and also strict conservation rules. Wreck dives are available in some areas but only the islands to the south have wall dives, drop-off dives and drift diving opportunities as well. Outer Island diving is rich and varied, featuring everything from mini-walls and canyons to migrating Manta Rays, numerous wreck sites and some of the finest Gorgonian fans in the Indian Ocean. Diving on Aldabra’s terraced walls is dramatic and Green Turtles are common both in water and on their habitual pilgrimages up the beach to nest. The Cosmoledo atoll offers huge hard coral bommies with 10 feet / 3 metre Gorgonian fans and massive barrel sponges all under the watchful guard of inquisitive Potato Bass. Astove’s settlement reef presents another awe-inspiring wall dive whose reef top is incised with crevasses and caves and boasts a large resident Green Turtle population. Dive depths vary, ranging from 9 to 22 yards / 8 to 20 metres for inshore sites and up to depths of 44 yards / 40 metres for dives offshore. The Inner Islands’ marine life reveals an abundance of fish even on shallow inshore reefs and features different types of Butterfly fish and Angel fish, Soldier fish, Squirrel fish and Sweepers among many others. The island reefs are also havens for many invertebrates including Octopus, Spiny Lobster and a plethora of Nudibranchs, such as the Spanish Dancer. 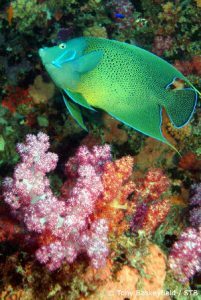 Sites with regular current flows support fan corals and colorful tree coral formations while more remote sites shelter the larger fish species, such as the Napoleon Wrasse, Giant Grouper, Reef Sharks and Ribbon-tailed Stingrays. Most spectacular are the plankton-eating Whale Sharks found all year around the Inner Islands, with peak sightings in August, and October through January. Marine life around the relatively isolated Outer Islands tends to be even more prolific, with frequent sightings of many of the larger grouper species, particularly the spotted Potato Bass as well as Grey Reef, Silver Tip, Nurse Sharks and the occasional Hammerhead Shark. A number of rare exotics have been identified from this area such as the African Pygmy Angelfish thought to exist only in small numbers at depth off Mauritius and now found regularly in easy diving depths off Astove. The cartoon-like Yellow Rubber Lipped Sweetlips is another firm favorite while elusive Long-Nosed Hawkfish can be easily found in most Gorgonian fan areas. 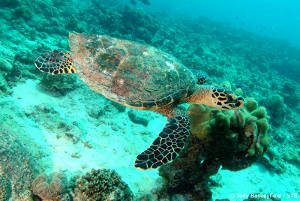 Seychelles offers year round diving experiences in waters mainly outside the cyclone belt and dive centers around the country cater for novice and experienced divers alike, offering a number of specialized courses. Divers should bring proof of certification and medical clearance for any medical problem. Most dive centers offer modern dive equipment rental and service facilities. However, repair facilities for divers’ own gear may be limited, subject to availability of specific spare parts. It is recommended there be a 24-hour safety window between the divers’ last dives and their next flight. Divers need to bring proof of certification to be allowed to dive. However, those who have lost or forgotten their certification cards or log-books may be allowed to dive with a Dive master to a maximum depth of 13 yards / 12 metres, at the discretion of the dive center. Those planning to take a diving course who have had a previous medical problem, should obtain and bring with them a certificate from their doctor indicating that they are fit to dive. Local physicians in Seychelles are able to perform a diving medical if required. Any medically fit person over the age of 10 and able to swim can learn to dive. Diver training is conducted by internationally qualified and insured instructors most of whom are members of PADI, the Professional Association of Diving Instructors, the world’s largest diver training organization. A non-certification “Discover Scuba Diving” introductory course for first timers is available leading either to the basic “Scuba Diver” qualification or a full certification as “Open Water” Diver. Experienced diver courses are available to instructor level with specialty certifications available from certain centers, such as underwater photography, wreck and night diving. For visitors not wishing to bring their own, all licensed dive centers rent out properly maintained, modern diving equipment which is inspected on a regular basis. The centers also have a range of other beach accessories available, including snorkeling equipment. To minimize the possibility of a decompression incident at the end of a diving vacation, the current recommendation is that divers should leave a minimum of 12 hours after their last dive before flying and, where possible, a 24-hour period is recommended. The centers will not allow divers to dive on the morning of departure or prior to an inter-island or helicopter flight. Book Authentic South African at the Luxe accommodation level and celebrate with a 50% companion discount for the second traveler. Book by June 30, 2019 for travel by October 31, 2019. Valid on new reservations only. Book the Tanzania Adventure at the Classic accommodation level and celebrate with a 50% companion discount for the second traveler. 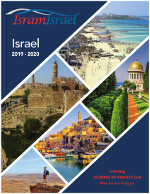 Book by June 30, 2019 for travel by October 31, 2019. Offer valid for new bookings only, subject to availability, may not be combined with any other offers.